Note: If you want to sit and try to play every note of every song and take 2 weeks or more to do so, then this collection is not for you. But if you want to sit down, open the book and play the songs at the 1st sitting this is the book for you. This way you become you, not a clone of someone else's thinking. This is the Jeff Newman theory. Go with it. As I have done in all my tab books is I give you the melody so that you can have some sense of accomplishment right away. I am not charging you for one song, but 12 songs with backup CD. The best deal on the Forum. My email can be found on my web site, along with other info. some of Hank's better known compositions. 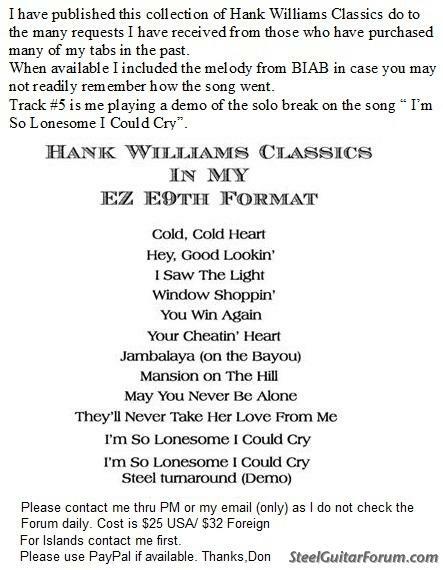 Some of Hank's songs done in my EZ format style. I just ordered this book from Don and he had it shipped before I got back from lunch! Don must live in the post office! Anyhow, thanks Don. I've had his E9 Course a few years back and liked it, so figured the Hank songs were a good choice. I like Don's tab because it is a basic straightforward version that you can "hear" the song as you play it without a lot of embellishments that can throw a beginner like myself off when you are trying to learn a new song. Some of Hank's song in my EZ play method. top notch EZ to follow and play songs without the BLAH!